Good location. A few minutes walk from the Metro station. The hotel lobby was nice and welcoming but when I first arrived in my room, it was a bit downhill. The room was clean enough but the walls were dirty with grubby hand marks and fingerprints. A lick of paint would have done wonders!The shower either dispensed boilng hot water at a dribble or a gush of cold water; nothing in between. The noise at night from other guests running,shouting and banging doors at all hours was very disturbing, but that's not really the hotel's fault. Overall, an average hotel with nothing to boast about. No hot water for five days, no airport transfer, no Wi-Fi, no heat in the room, bad breakfast. The hotel staff are very good in receiving and accommodating the guest. It can be easily located in Karolbagh..
Has a small elevator; staff is very helpful; typical small Indian hotel. There is no internet connection inside your room... only in lobby without adapter for plug. I've been to this hotel couple of times, while traveling in India. 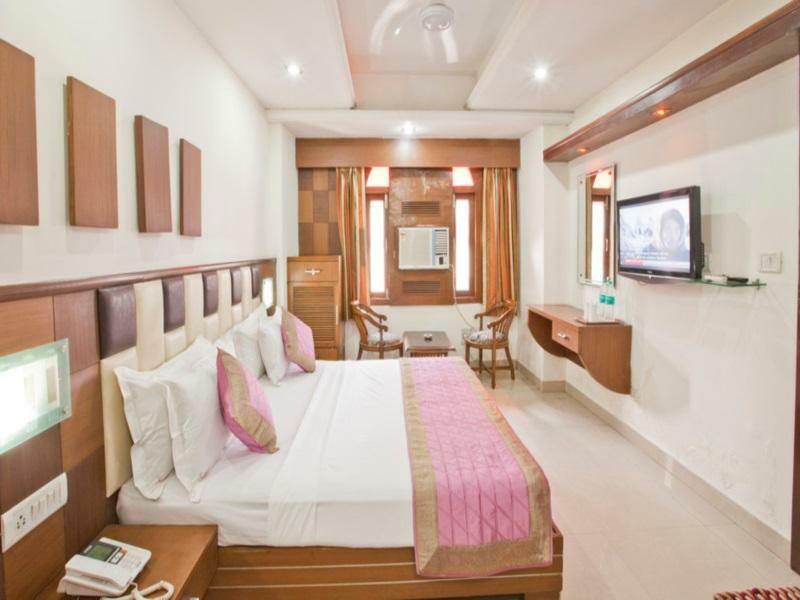 Hotel is situated in 2 minutes walk from metro station Karol Bagh. Rooms are much different from each other. The first room we had was without a window! I really hesitate about it, because I dont't like such type of rooms. After a short conversation our room was changed. That's plus to the stuff, which is rather helpfull. The rooms have lcd tv, soft beds and pillows, so you can sleep well before Your onward journey. I didn't like you can't have a hot water immidiately when you want it. Hot water time is from 15-20.00, or you should call to the reception and ask for it (the same situation in every hotel in India). Absence of mosquito nets and the mosquitos. So it's hard to sleep with open window. Absence of safety box in room. But it's easy to put a values in safe at receptin - that's plus. If you looking for a local New Delhi experience with good hotel service, then you must not missed Hotel Sarthak Palace. This hotel located within walking distance to Karol Bahg Metro Train Station. Once you arrived at Karol Bahg Metro Train Station, you can either make arrangement with hotel to pick u up, or try to make your way to hotel which is a whole lot more interesting (for first timer) to experience the bustling life of New Delhi, or if you prefer airport to hotel transport, the hotel will gladly make an arrangement for you. Besides, there is a famous local bazaar within walking distance. Ask them for tour guide if you need one to show you around. My wife and I found that the service at Sarthak was unhelpful. There were mixed communications about getting us a map (they did not have one, in the end), and the service was spotty. The guy in the evening was very helpful but others were not as friendly or open to questions. Also at one point when we were having a snack delivered one of them actually walked into our room without knocking...awkward and uncomfortable, especially as he did not seemed bothered. We also saw two people check out of their rooms and refuse to pay charges because their rooms were filthy or they were charged incorrectly. Altogether just a strange feel. the rooms , instead, we were given a filthy room and equally a dirty bathroom. the staffs were woefully incompetent; it is easy to see that they have very little experience dealing with foreigners. they do not understand what we want at all and none of them speak english. indian underhandedness: sweet talking, chai, small talk, and then giving us an impression that they are doing a favor by upgrading you. 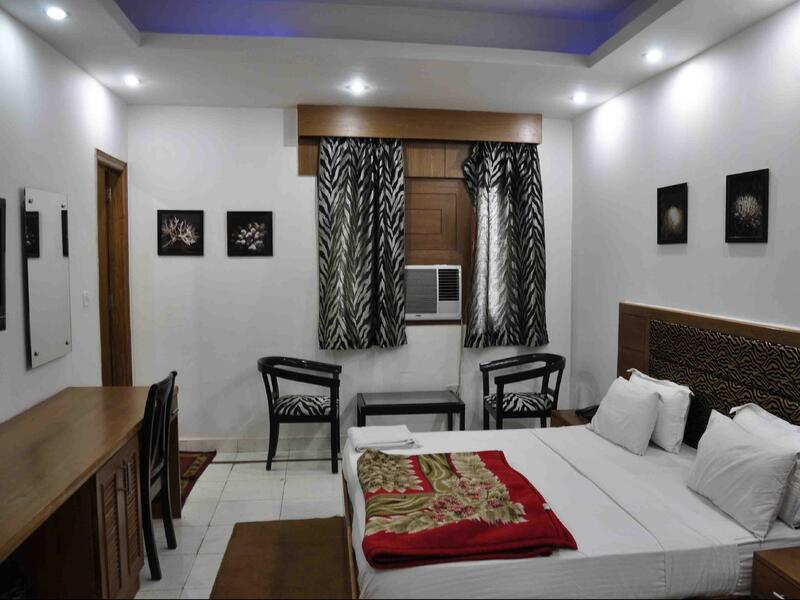 The hotel is in the middle of the shopping district and very near to Karol Bagh metro station which is definitely a plus! The staff are very friendly and helpful. Unfortunately there was still some building going on while I was there, so during the day it was rather noisy. I think it's gonna be a good "value for money" hotel when it's done. Confortável, com boa relação qualidade-preço. Atendimento simpático e prestável. Localizado perto de estação de metro. สถานีรถไฟใต้ดิน Karol Bagh - ระยะ 0.27 กม.